Side 1 was produced by Ed Welch; Side 2 doesn't appear to have been produced by anyone. 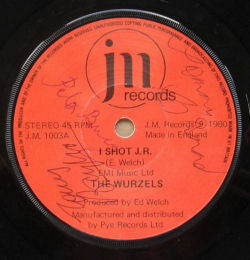 Released in 1980 as a follow-up to the I Hate JR/I Love JR double a-side; The Wurzels expose their true feelings towards Dallas's JR Ewing. The single pictured right has subsequently been signed by Tommy, Pete and Tony - obviously that didn't come as standard!